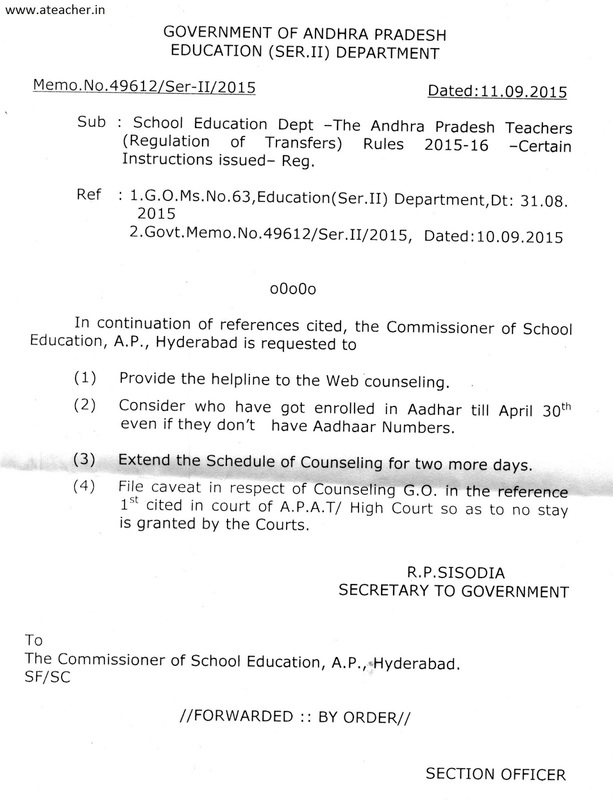 AP TEACHERS TRANSFERS THROUGH WEB BASED SCHEDULE HAS CHANGED.ESPECIALLY SUBMISSION OF INDIVIDUAL APPLICATIONS DATES ARE CHANGED. PREVIOSLY THEY ARE AS FROM 10-9-2015 TO 12-09-2015(3DAYS) BUT NOW GOVERNMENT OF ANDHRA PRADESH ,CSE,AP DECLARED THAT MRE THAN TWO DAYS WERE EXTENDED FOR ONLINE SUBMISSION i.e. 13-9-2015 AND 14-9-2015. SO ALL TEACHERS NOTE THIS POINT.AND MAKE A SUCCESEFUL SUBMISSION OF YOUR ONLINE APPLICATION.